I think the word "awesome" doesn’t even begin to describe "Independence Daze"! Ethan, Benny, and Sarah wake up in their own universes and they have to battle their fears to get out, and Ms. Weir senses danger in the near future. Meanwhile Erica needs Rory’s signature for her to help set up parties for the vampire council, but Rory uses this to suit his needs with Ethan and Benny mysteriously gone I thought this was a really great episode and it makes up for "Hottie Ho-Tep" that aired last week, but technically "Independence Daze" is the 11th episode of the second season, Disney aired the episode as part of a "Phobia Themed Friday Night", but the Canadians will see all of season two in order on Teletoon. I liked how Grandma Weir – who is finally given a first name, Evelyn – teaches them a lesson by putting the trio up against their fears, versus it being some ghoul seeking revenge (that might would have made this episode a two-parter as well). These three are good together, I especially like the scenes where Benny and Sarah are just back-and-forth with each other; but after seeing some behavior Sarah has been exhibiting, especially in "Hottie Ho-Tep", maybe she will now not take them (mostly Ethan) for granted. Also good to see Rory using Erica for once, she often treats Rory like a tool. "Independence Daze" is an episode that kept me on the edge of my chair, and this episode leads to the two-part season finale ("The Date To End All Dates"), so for Disney fans, we’re going to be left in suspense and anxiety for the season finale for a little while longer. I just find it funny that while impending doom is coming, Benny is asking for cookies. For right now, this is my favorite episode of MBAV above "Welcome Back Dusker" and "Re-Vamped", but that’s just me. The episode begins at Whitechapel High and Ethan is walking through the halls with a pair of red gym shorts on his head, looking around, a figure dressed in black walking with something glowing in his hand. Sarah also is looking around in the halls, an evil version of her storming through. Benny is as well, carrying a mop; a “cyberdontist” behind him. Erica walked in the cafeteria to find Rory, asking where they were. Rory said he didn’t know, and said they were missing “Taco Tuesday”, it wasn’t wise. Rory then ate a taco, then offering Erica one, saying he must be a gentleman, she told him not to talk with his mouth full. The night before, Mrs. Morgan was giving Benny, Ethan, and Sarah milk and cookies, asking them if they were too old for that. Benny said maybe, but you can’t be too old for a cookie sandwich, biting into three cookies stacked together. Sarah said to him just when she thinks he’s found every way there is to be disgusting, he’s found another one. Ethan had his cookies the same way and quickly put them down, awkwardly agreeing with Sarah, telling Benny to grow up. Benny’s grandmother Evelyn, then walked in. She said she came to make sure Benny wasn’t making a mess, magically knocking over Benny’s glass of milk, and then asking for some napkins, Mrs. Morgan went to go get them. Ms. Weir asked them what they had to say for themselves, Benny said it was an easy explanation, Sarah didn’t believe in trolls and Ethan bet he couldn’t conjure one. Benny asked her what was he supposed to do. She said he didn’t conjure a troll; he conjured a “toll” that it cost her five bucks to get out of her living room. Ethan gloated that he won the bet. Mrs. Morgan was about to come over with some napkins when Ms. Weir knocked over a plate of cookies, blaming it on Benny. Mrs. Morgan said she would go get the “dust thingy”. Benny said at least he conjured a toll booth, asking if Sarah or Ethan could do that. Sarah told him that she fights while he hides, adding that he hides every time a robot-dentist movie is on. Benny explained to her that Cyberdonist came to this planet to fill their cavities with pain. Benny then said at least he wasn’t hiding for himself, a hint towards Sarah. Sarah asked what it meant, Ethan answering instead that it meant she was a vampire who was afraid to bite people. Sarah then gave him a look, Ethan defended that Benny said it, he didn’t. Sarah asked was he so perfect. 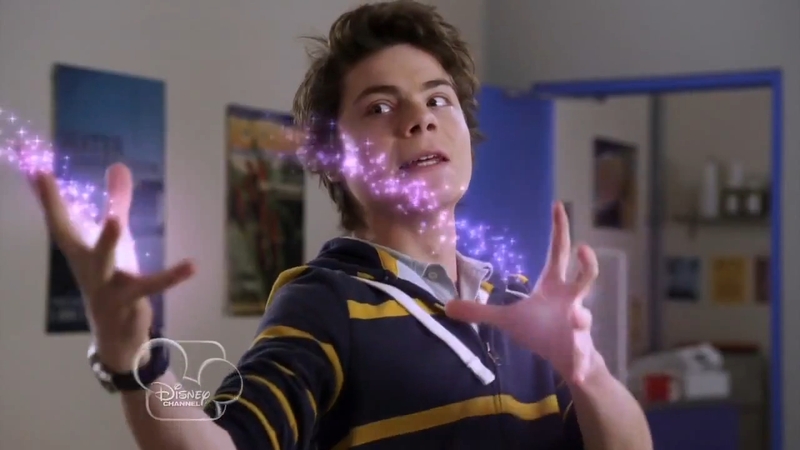 Ethan replied between Benny’s magic and Sarah’s “smash happy strategy”, they’d both fell without his bulletproof genius plans. Grandma Weir told them to stop, that they were a team. Mrs. Morgan then sprinted by to the hall closet. Ms. Weir continued saying that she sensed darkness, a force so powerful and evil that they had no chance against it alone. All three of them were texting and weren’t paying attention to her, Ms. Weir noticed it and stressed that they had to work together; Mrs. Morgan then came back with a portable vacuum asking did they hear the thunder. The next morning Ethan was pouring himself a bowl of cereal, he was about to pour some milk when it came out sloppy. Ethan yelled out to his mom that the milk had gone bad. Ethan called for both of his parents and neither of his parents came down, he shrugged it, looking at the mess in his bowl and yelled, out for Jane, that he made her cereal, but noticed Jane didn’t come down either. Ethan grabbed his things and headed for school. Benny was walking across a street, eating a plain donut; he looked around and magically changed his donut to a chocolate one with sprinkles, Benny then took a bite, happily. Sarah was walking behind the school, noticing there were no students around. Benny was in a classroom, burping, he turned around saying that that one was on him. He looked and saw there weren’t any student around him. Benny deduced that either he was too early or too late. Ethan walked through the hallways, reading a book, noticing they were empty. Ethan thought that the school trip to the candy factory was next week. Erica walked up to Rory, asking him what he was holding. 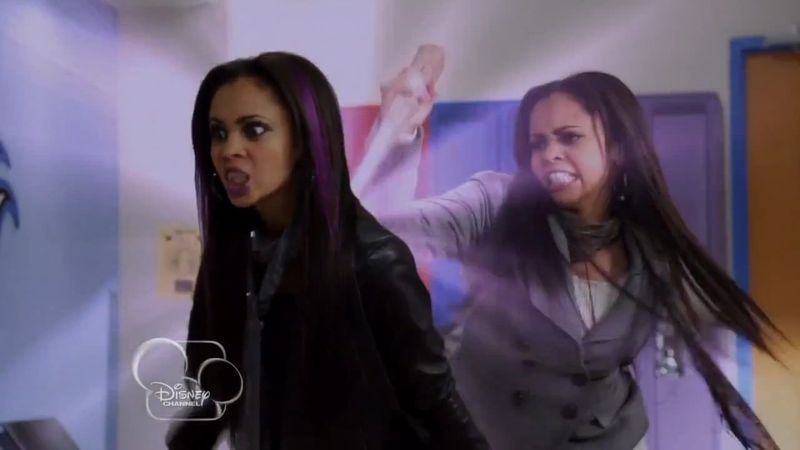 Rory said it was Vampire Sasquatch, asking her could she believe the show was canceled after nine seasons. Erica said yes, and asked him had he seen Sarah. He told her yes, she then emphasized that day, he then said no. Erica said that she wanted to run for vampire council party planner, but she needed two other vamps to sign for her, then adding in their own blood, then sticking Rory in the hand with her pen, getting some of his blood. His skin regenerated and he took the paper from her, reading it, asking what would she do for the “fangy community”. Erica took his stuffed animal and said she’d make sure his furry friend’s head stays on its body, Rory corrected that his head was already on his body. Erica titled it’s neck back and drew her fangs. Rory thought for a minute but saw Erica was trying to trick him, taking his animal back, saying it was a vampire, that it would just regenerate. Erica then asked him what would it take, he told her to hang out with him, because for some reason Benny and Ethan weren’t around. Erica rolled her eyes as Rory started talking to his stuffed animal, agreeing with it, saying it was strange. 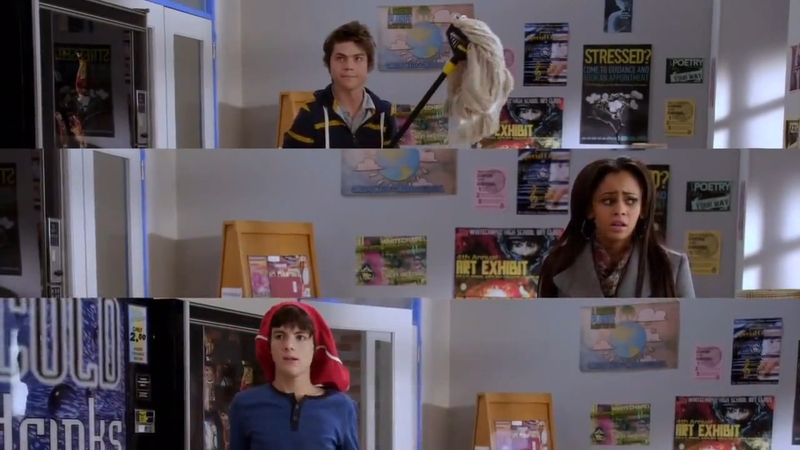 Benny, Sarah, and Ethan were walking in the halls alone, Sarah asked out loud did Benny do that, Ethan asked did Benny do a spell backwards again, and Benny asked himself if he did it, it felt like something he did. Benny said that he bet the disappearing spell went wrong, or everyone turned invisible, or he made everyone silent and tiny, and that he was their overseer. Benny smiled, happy about that. Ethan looked around, said he was alone, and walked into an empty classroom. A dark and glowing figure behind him. Sarah tried to call Ethan but was annoyed she couldn’t get him, she then heard a beep and asked if it were Benny. Sarah yelled out that she didn’t know what was going on, so she was out of there, running out of the school. Ethan walked to the principal’s office and sat at the desk, picking up the phone, which had no dial tone, he then pecked on the computer, which wasn’t working. Ethan said there was no phone, no internet, and no people, and now he was trapped in some pocket dimension, that he needed a genius plan. He then looked at the microphone, and said maybe not right away. Benny walked into the cafeteria and said his favorite class, saying fries, blissful. Sarah was walking from the back of the school when an evil version of her asked was she playing hooky; it’s not the Sarah she knows. Sarah said that she looked like her, evil Sarah agreed adding that she was stronger, faster, and cooler, that she was the her that Sarah was to chicken to be, Sarah then rushed off. Meanwhile Ethan began singing about heck bots into the microphone, his voice echoing throughout the school, and Benny was greedily eating French fries. Benny then looked at some celery sticks and said that he had to have balance. Taking a celery stick, a French fry and dipping them in some ketchup before eating it. Ethan sat down and looked at Prinicpal Hicks’s coffee cup which read “#1 Prinicipal”, Ethan said he guessed they couldn’t fit the word “worst” in there, saying “Boom”. 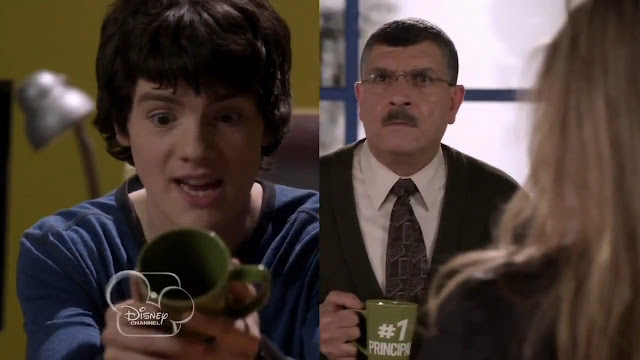 Principal Hicks asked Erica and Rory did they have class, as Ethan picked up Hicks’s coffee cup, Principal Hicks hearing Ethan’s voice asking for help in his head. Rory quipped if someone was in Hicks’s head, they must be pretty small, Rory held up a hand for Erica to agree with his joke, she didn’t. Ethan questioned how did Hicks hear him, shortly before running out of his office. Sarah stopped, thinking she finally got away from her evil self, saying that Mr. G was right, that she was her own worst enemy. Then Evil Sarah appeared, Sarah irritated asked her what did she want from her, her evil form told her for her to stop running from herself. Sarah said fine, she wasn’t running, and took to the skies. Benny still eating fries said if he did this, he was awesome. Benny turned around when he thought he heard someone in the room with him, shocked to see Cyberdontist. He told Benny to brace himself, that by his calculations, it was time for a checkup. Benny got up and said he knew this would happen someday, and he was ready. 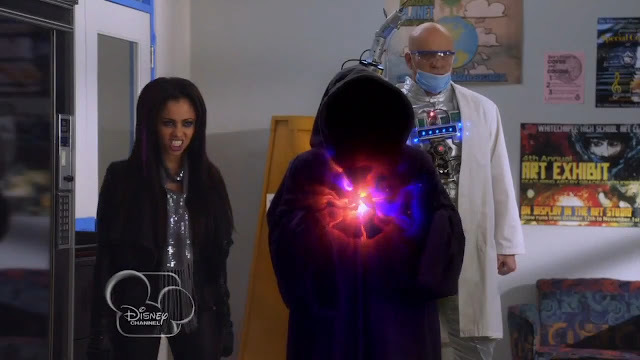 He said an incantation and aimed it towards the Cyberdontist, and it went right past him, Cyberdontist told him that dentists were immune to magic and told Benny to open wide, coming after him. Benny ran off, Cyberdontist after him. Ethan had a pair of headphones on from his locker, asking Benny could he hear him. 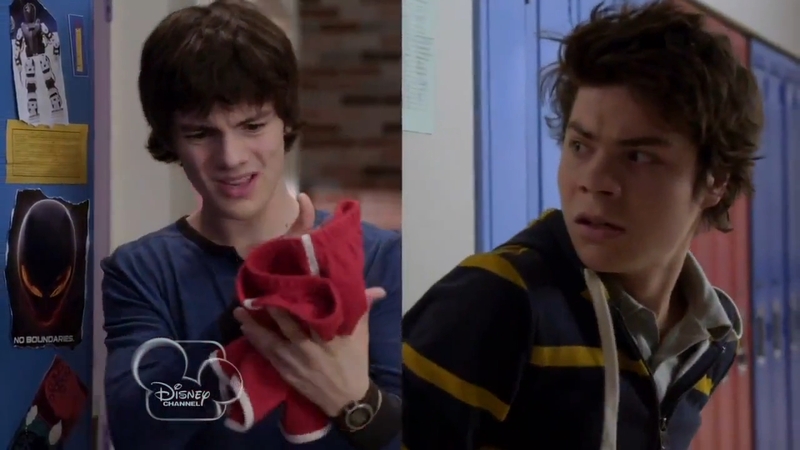 Ethan then searched around and found Benny’s gym shorts, asking if Benny could hear him. Benny did and asked Ethan why was he shouting inside his brain, asking him what was going on. Ethan asked Benny to tell him, asking did he do this. Ethan explained they were in their own universes. Ethan said to him for some reason he could talk to him through his gym shorts, Benny joked worse cell phone ever, Ethan asked him what was so special about them. Benny said it was nothing, he hated gym more than anything, when he puts the shorts on, he feels like a cotton-shame blend. Ethan figured out it must be an emotional connection, telling Benny he was running to try something. Ethan then pulled out Sarah’s “make up thing”, remembering Hicks took it last week and Sarah was upset about it. Ethan opened it, seeing a picture of Sarah in it, Ethan guessed that if you couldn’t see your reflection, it’s nice to remember what you looked like. Sarah then asked Ethan why could she hear him, Benny told her it was because he was holding her “makeup thing”. Ethan asked her where she was, Sarah asking him the same, saying there was no one in town anywhere except for her evil twin who keeps hunting her. Benny told her at least her problem was hot, he was being followed by Cyberdontist, and that his drill was a lot scarier up close. Ethan asked were they both being attacked, he was completely alone. Benny said lucky him. Ethan told them he had an idea and to meet him in the lounge as soon as they could. Ethan walked out to see a guy in a cloak, without a face. It fired a magic blast towards Ethan and he ducked. Ethan said to them that he was so caught up with them now. Ethan came around a corner and saw Benny and Sarah then appeared, Ethan saying he could see them, taking the gym shorts off of his head, he asked them could they see him. Sarah answered barely. Ethan told Sarah to grab her compact and Benny to grab his shorts, Benny grabbed his pants, Ethan saying he meant the gym shorts. Ethan pulled them into the universe with him. Sarah said that them being trapped together wasn’t much of an upgrade. Ethan told them they needed to move that he was being followed by a guy with no face and a lot of fire balls. All three of their fears then came into the lounge, Benny joking he liked it better when it was himself and “Mr. Silver Pants”. Benny said it was his worst nightmare, a fire juggler and a cooler version of Sarah. Ethan said at least they’d be destroyed together, Sarah snapped that that was the upside. The cloaked figure then threw a fire ball at them, missing them. Meanwhile in the regular universe, Erica was upset she had to hang with Rory AND his “dolly”. Rory then asked what Vampire Sasquatch asked, Rory saying he was right, that Erica was being a little snooty. Rory leaned into the animal again and said he didn’t think he’d sign the “council thingy”, Erica hissing at him. 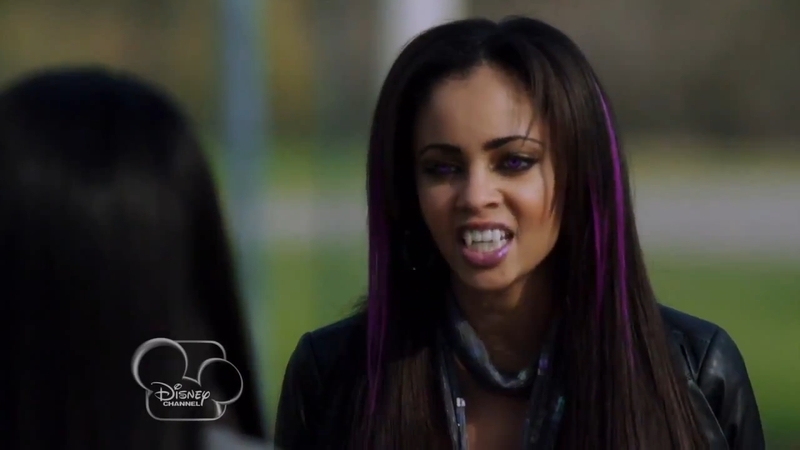 Rory then agreed with Vampire Sasquatch that Erica’s fangs were too big for her face, who would vote for that. Erica covered her mouth. Ethan, Benny, and Sarah locked themselves into a classroom and waited for Cyberdontist to go by. Sarah asked were they just going to stand there and wait, Benny corrected that they weren’t waiting, they were hiding, a much better plan. Sarah said annoyed that she should just go out there, Benny asked her to get roughed up by herself. Sarah told him that he couldn’t even magic himself out of a dental appointment. Ethan said their arguing wasn’t helping, Benny suggested that he go out there and touch “Hoodie McFirepants” and get a vision, Sarah had an agreeing facial expression. Ethan said spoiler alert, he’d cook him. Ethan said that they had to go after them together, asking Sarah how do they stop her. Sarah corrected that it wasn’t her, it was the her she didn’t want to be. Ethan asked her why not, Sarah said it was because she didn’t have a conscience and she eats people. Ethan said to start with that. 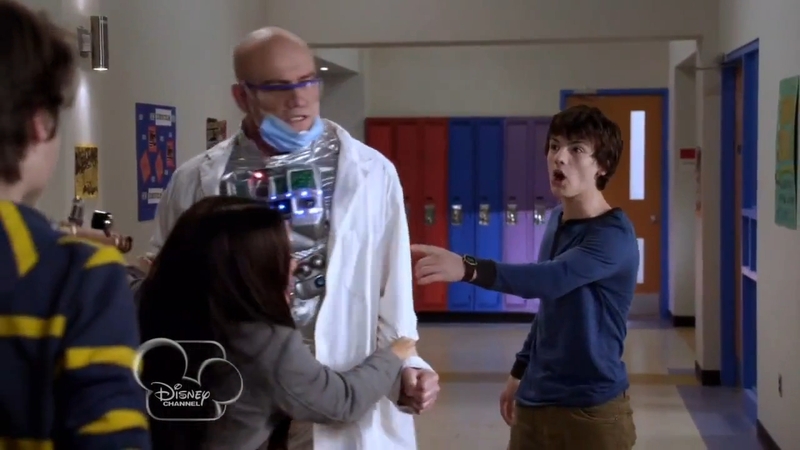 Evil Sarah was walking through the halls and heard Benny saying he ran track today and his blood was pumping like crazy. Evil Sarah saw them and went after them, Ethan and Benny apparently “tripping” in the halls. Ethan said their weak and human bodies couldn’t run any farther, Evil Sarah said she could use a lunch break, Benny said that lunch was so served. Evil Sarah was about to attack when she asked where her “lame-o look alike was”. Ethan and Benny continued taunting Evil Sarah with their blood. Evil Sarah said she guessed she could dine and dash, she was then staked by Sarah. Ethan and Benny were smiling at her, Sarah said that that was one down, it was a shame though, Sarah said because she liked her boots. Benny whispered that for the record, Evil Sarah had a much hotter look, Sarah defended that she does pretty good for someone who can’t use a mirror. Benny smiled at her and said point taken. Sarah asked that magic didn’t work on dentists, Benny told her that he wasn’t just a dentist, he was a computer. Ethan said that computers were all about logic, so that’s where they hit him. Benny said he’d rather hit him with a train, but logic was okay. Sarah crumbled something in half asking the Cyberdontist was that animal cruetly to him. He was about to attack Sarah when Ethan asked him why do they park in a driveway and drive in a parkway, the Cyberdontist started seizing up, Ethan asked him that his mission was not to accept this mission, did he accept. Sarah said it was working, Ethan asked why do you put coffee inside a coffee maker, doesn’t it make coffee. Benny said to it that once he ate a whole half of pizza, emphasizing, a whole half. Sarah looked at Benny as the Cyberdontist kept seizing and Sarah pushed a button on its chest. Ethan said it worked, he knew Cyberdontist couldn’t handle logic paradoxes. Sarah said that she just found it’s off switch, that it was there the whole time. Ethan said one to go as Benny said that he had an idea, wondering if they could play video games on him. Benny touched the Cyberdontist and it twitched, Benny saying never mind. Benny asked Ethan who was in the bathrobe, Ethan said he didn’t remember him from any of his top ten nightmares. Sarah asked Ethan if he didn’t know what it was, how they stop him. Ethan remembered that he pulled them into his universe, Benny saying someone from the real world could pull them out. Ethan said maybe, they needed an emotionally charged object. Benny suggested Erica’s locker, Sarah said that half the stuff in Erica’s locker wasn’t hers. Ethan said he knew where they needed to go, to Rory’s locker, Benny said it was a good thing he knew Rory’s combination, but Sarah just pulled the lock off. Sarah opened his locker and quipped that she thought there would be more toys. Ethan then saw Rory’s Vampire Sasquatch stuffed animal and picked it up, saying it must have been kind of lonely, before calling for Rory. 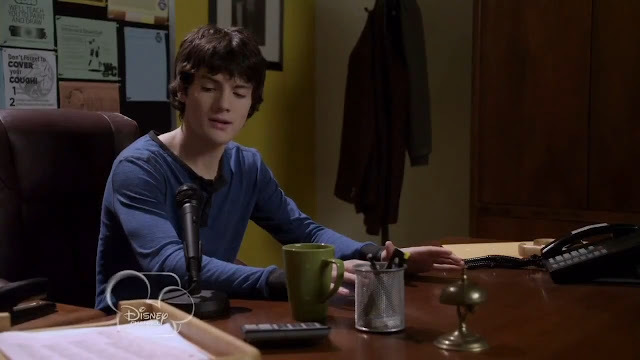 Rory asked what his Vampire Sasquatch said, saying that it sounded like Ethan. Erica reached for the animal saying they needed a timeout, she and Rory tugging it. Ethan yelled that it was him, they were trapped in an alternate dimension. After hearing that, Erica told Rory she had been hanging out with him for way too long. Benny looked to see the cloaked figure getting ready to throw a fireball at them, they managed to get away, the fireball hit the lockers. Benny yelled into the Vampire Sasquatch that they were being chased by a walking flamethrower and they had to get them out of there. Erica said only if Sarah signed her council application. Sarah yelled that wasn’t it due a month ago, and Erica snatched the doll from Rory, yelling that she hung out with Rory all day for nothing, other students laughing at Erica for seemingly yelling at the doll. Ethan yelled for them to meet in front of the school, the cloaked figure walking behind them. Rory and Erica ran around a corner, Rory saying he dug the ghost look, Benny said that they were the ghosts, Ethan said they were all ghosts and to grab Vampire Sasquatch, Rory said he already had him. Sarah told him the ghost one. Erica and Rory grabbed the one Benny was holding and started pulling them. Ethan turned around to see the cloaked guy starting another fireball. Erica and Rory pulled them in just as he fired. 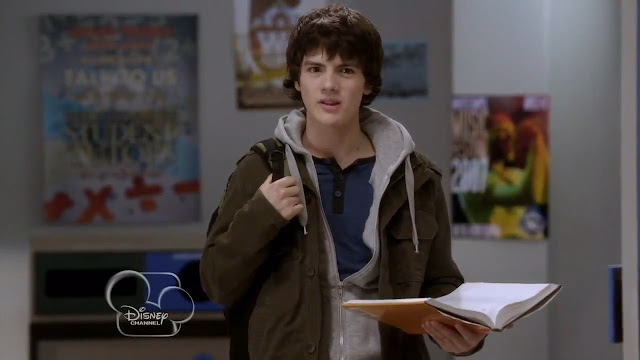 The other students in the hallway were looking as Benny yelled “Tah Dah!”, he and Erica bowing, Ethan and Sarah laughing awkwardly, a few people clapped. Later that night, Benny was telling his grandma about Cyberdontist and that he didn’t cry once. Sarah added that they worked together, Ethan adding that they got out alive, and that grandma knew that already. Ms. Weir said that she was glad they learned their lessons, even if it took flinging them into three different dimensions. They all asked her “what”, she told them they were never in any real danger. Benny told her to tell that to the crazy robots and Evil Sarah’s, he told her to dial it down. She told him to cowboy up, she told him they were their fears, that they needed a reason to work together. Ethan asked her who was the faceless guy in the hoodie throwing fireballs at him. Ms. Weir told Ethan that he was supposed to be alone, that his fear was losing those closest to him. Ethan said it used to be, but now it was fireball throwing guy. Ms. Weir told Ethan no one was supposed to be there with him, it must have been the darkness she felt, trouble was coming. Ethan and Sarah looked concerned. Benny then asked was there any cookies left, if he didn’t get any cookies, then there would be trouble. Ms. Weir, Sarah, and Ethan looked at Benny who was sipping in his cup, Benny not seeming too concerned, the episode jumps to black. 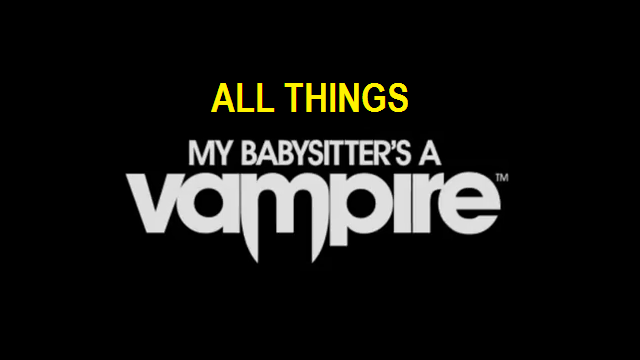 I LOVE THIS SHOW SO OF COURSE I LOZE ALL THE EPISODES!!!!!!!!!!!!!!!!!! !